Following a month-long trial, a Union County jury found a Hillside man guilty of 10 charges including aggravated assault and eluding, announced Union County Prosecutor Theodore J. Romankow. 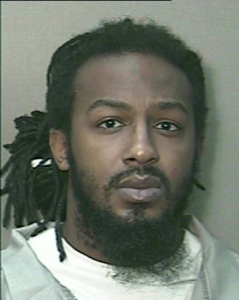 Fuquan Stribling DOB: 5/5/1983, faces 30 years in prison when sentenced. He was found guilty of Four counts of 2nd Degree Aggravated Assault, Three counts of 3rd Degree Aggravated Assault, One count of 2nd Degree Eluding, One count of 4th Degree Obstructing Administration of Law and One count of 3rd Degree Possession of a Weapon for an Unlawful Purpose. Assistant Prosecutors James Tansey and Robert Vanderstreet of the Special Prosecutions Unit of the Union County Prosecutor’s Office handled the case. On March 30, 2009. Hillside Police had been alerted to reports of a car thieves operating in town. A short time later, Officers Ryan Cruz and Bryan Arrington pulled into a darkened alleyway behind Liberty Avenue around 1:45 a.m. where they observed a red two door Honda awkwardly parked in the alley with a man standing outside, who fit the description of the earlier car thief, said Romankow. As they approached, the man, later identified as Stribling jumped into the car. The officers identified themselves and Officer Arrington attempted to open the drivers side door, while Stribling struggled to keep it closed. Stribling put the car in drive and knocked down the Officer Cruz who had stepped to the front of the vehicle to read the license plate. At that point, Officer Arrington fearing for his partner’s life, opened fire at the driver. Stribling put the car in reverse but soon putting the car back into drive and again towards the officers. This occurred several times, with the officers firing at the vehicle as it approached, in an act of self-defense. While in reverse up, the Stribling encountered a backup unit from the Hillside Police. The Honda struck the second vehicle, knocking Officer Shakeema Wilson to the ground while she was exiting. In response, Wilson’s partner, Officer Matthew Casterline, opened at the driver. The collision with the second police vehicle was so severe that the bumper was broken in two places and metal supports to a front grille guard were snapped, said Romankow. The car finally came to rest, with Stribling still at the driver’s seat. It was later revealed that Stribling was not the person wanted in connection with the car thefts, said Romankow. He had left his girlfriend’s house in Newark earlier in the evening with the woman’s car. He picked up another woman from Hillside and the two were engaged in sexual acts when the police approached. He was naked at the time officers apprehended him and he was intoxicated, according to blood tests taken at the time. A urine screen later revealed that Stribling had drugs in his system as well. The officers provided Stribling with medical attention at the scene and he was later transferred to University Hospital where he underwent treatment for various injuries. None of the officers were seriously harmed. In November 2009 A Union County Grand Jury handed down indictments against Stribling. The officers were cleared of any wrongdoing. The Grand Jury said it was clear that the use of deadly force by the officers was legally justified because their lives were in danger.